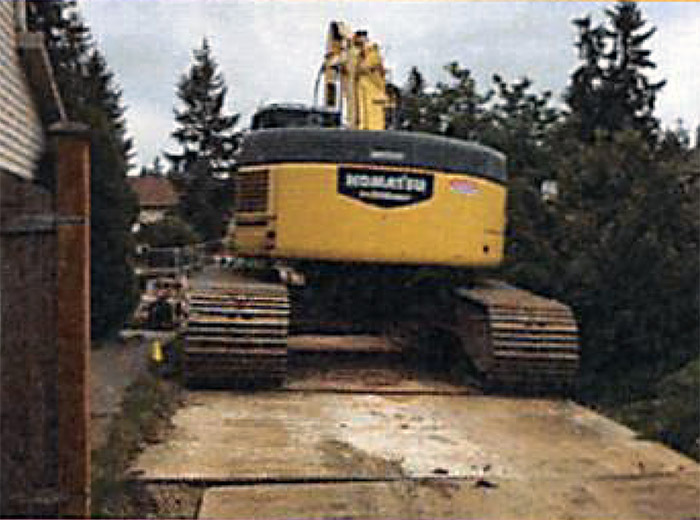 The Sweetwater Ranch stormwater pipe repair required heavy equipment and cost about $900,000. Photo courtesy of City of Mill Creek. The City of Mill Creek owns and is responsible for maintaining a stormwater system comprised of catch basins, underground pipes, retention ponds, and water treatment facilities. The city’s stormwater system conveys rain water from rooftops, driveways, sidewalks, roads and other impervious surfaces to water treatment facilities such as retention ponds before eventually ending up in local creeks, streams, and wetlands. When stormwater pipes fail and develop leaks, rain water disperses into the ground and carries away surrounding soil as it does. This results in voids, which in many cases cause sinkholes. Realizing that the Mill Creek stormwater system is aging and that failures can result in sinkholes like the one at Sweetwater Ranch in December 2017, the city council approved a $130,000 consulting engineering contract with Perteet Engineering in February to help develop a capital projects plan. At the September 11, 2018, Mill Creek City Council meeting Public Works and Development Services Director Gina Hortillosa gave an update on this effort. The good news is that the preliminary stormwater system analysis was pretty much completed on time and the contract is under budget by $26,000 at this point. The bad news is that the analysis shows $750,000 to $1,000,000 of stormwater system repairs need to be made in 2019, with an additional $600,000 to $800,00 to be spent each year beginning in 2020. This totals out to over $5,000,000 worth of planned repairs by 2027. The analysis only looked at stormwater pipes larger than 18 inches in diameter, because their failure has the potential of causing the most damage. The large stormwater pipes represent about 15% of Mill Creek’s stormwater system and there are known smaller pipe failures that were not included in the cost estimates that will have to be repaired as well. Perteet Engineering consultant Dave Smith told the city council that the analysis identified quite a few serious failures in the city’s large stormwater pipes. He said the recent Sweetwater Ranch sinkhole was caused by an undetected large stormwater pipe failure. It cost the city about $900,000 and took months to fix this problem. Smith told the city council that fixing the Sweetwater Ranch stormwater pipe would have cost about $600,000 less if the failure had been detected earlier. Hortillosa told the city council that the repair estimates don’t include upfront design costs and inspection costs during construction. She said these costs could add 25% to the repair estimates. Washington State laws require all of Mill Creek’s surface water projects to be paid by special fees assessed to property owners. These projects include consulting engineering contracts, catch basin cleaning, pipe repairs, and anything else pertaining to the city’s stormwater system. Unlike some other Puget Sound cities that assess surface water fees to property owners monthly, Mill Creek property owners pay $78 yearly. This fee hasn’t changed since about 1998 and is included in the property tax collected by Snohomish County. Unfortunately, the $750,000 in total surface water fees collected by the city each year isn’t enough to pay for the stormwater system repairs that have to be made as well as the costs of ongoing system maintenance. Interim City Manager Bob Stowe told the city council he will hire a consultant to help figure out how much the surface water fee will have to increase. He told the city council this will cost about $45,000. The city council plans to hold a couple public hearings beginning on November 6th to discuss the budget for the next two years as well as the property tax rates and the increased surface water fee. The city would like to hear from Mill Creek residents regarding these issues. You can submit comments on the City of Mill Creek website at www.cityofmillcreek.com/responsecenter. Click on “Create a Service Request” and then “Public Works & Development Services” to find the type of comment you want to make. You will have to create an account on the website in order to submit your comments. There have been efforts in the past to get the City of Mill Creek to take responsibility for some water woes within the charter of the MCCA. This had better not be included. Why wouldn’t MCCA be included? I don’t understand. Why wouldn’t all the residences that make up the MCCA be included? That’s the original part of all of Mill Creek. The heart of the city. Besides that, omit the thousands of people in the MCCA and you have less residences in which to divvy up the cost. wht would the city omit a large part of the city? You misunderstand me. I am not saying that the MCCA are not to be included in the current surface water maintenance system, because they already are included. I am referring to are the MCCA private surface water maintenance costs that should not be added to the current public surface water management responsibilities of Mill Creek. In the recent past, people representing the MCCA has made attempts to lobby the Mill Creek City council to take over responsibility for the maintenance of all private retention ponds and basins within Mill Creek. There was no specific mention of covered detention vaults. On the surface that would seem to be a reasonable idea. That is, until you look into the issue a bit more closely. Consider the following statement made to the Mill Creek City council in 2013. The current surface water management plan states that the City cleans and maintains catch basins in the public right of way. Any catch basins that are located on private property are to be maintained, and repaired by the property owner. If you have a catch basin in your backyard your homeowners association would be responsible for maintaining that catch basin. The basic guideline for maintaining a catch basin is to have them cleaned when the sediment exceeds 60 percent of the sump depth as measured from the bottom of basin to invert of the lowest pipe. On commercial property the City recommends cleaning catch basins once a year due to the fact that there is more traffic and possibility of pollutants in the soils in the catch basin. The MCCA has quite a few (over 40?) private retention ponds that have always been the responsibility of the MCCA to maintain. For example, this maintenance would include dredging out the ponds when they get to full of sediment function properly. The cost to dredge a pond can be quite costly. I have information dated 2007 that suggests dredging cost can be as low as $4,000 for a 0.25 acre pond to $550,000 for a 10 acre pond. The legal expectations are for the MCCA collect enough money in a reserve fund to cover the eventual future costs for this work. I have a strong suspicion that there is not enough money held back to cover these costs for all of the ponds that have been filling up over the past 30+ years. One obvious solution is to make those costs somebody else’s responsibility. In 2010 the MCCA Cottonwood Subdivision needed to maintain and retrofit their private detention pond. The project was funded by a large grant from the Department of Ecology. The only cost mentioned: “It was expensive”. (Website: City Council Minutes - City Council Audio Recordings – February 26, 2013 – start listening at 1 hour into tape for the detention pond discussion). Perhaps this large, expensive Cottonwood project was the Clarion Call to the MCCA that they were facing a monetary crisis. In 2013, their Fish Ladder Pond would cost $500,000. These are only two ponds of their many ponds. Of course, not every detention pond will cost $500,000 to maintain, but there are over 40 pond ponds. This very much sounds like the MCCA has a water problem they did not adequately plan for and are looking for ways to have other people help pay for. To be fair, other HOAs within Mill Creek have similar surface water infrastructure that is maintained by those same HOAs. For example, my neighborhood has a covered water retention vault that has filters in it that prevent silt and other debris from “going downstream”. Those filters need to be replaced when they become filled/clogged at a cost of about $5,000 every 5 to 10 years. Our HOA is responsible for replacing them and recently had to have a special assessment to do just that. We now have a reserve fund to cover that specific eventual future expense. We also spoke with Marci Chew, Storm Water Specialist. She stated that if your HOA’s detention pond/vault has been inspected and properly maintained, you are not adding to the silts and debris of the MCCA detention ponds. Your system is sending only clean, filtered water back into the public system. Your filtered water may not even be co-mingling with MCCA’s. Our water travels through Thomas Lake and never touches MCCA. In the past, we have discussed this with people "in the know" and the results of just including the maintenance of water retention ponds within the MCCA could easily triple or quadruple our current yearly assessment of $78. This estimate also assumed that the MCCA and other non-affiliated HOAs did not make a one-time contribution to cover the costs incurred to date. This could get expensive real fast and the MCCA would easily benefit the most.